Story blurb: For over a year, widowed Cameron Jackson has tried to juggle his business with childcare for his two year old daughter …all while living with Deefur, a Great Dane who believes he rules the house. Nannies last a day, some don’t even make it through the front door if the self-proclaimed ruler doesn’t approve. Something has to give. Enter Jason Everson, nanny, teacher in training, apparent dog whisperer, and the only man who seems to make it past the initial scrutiny of the king. Can Jason help Cam put his house in order and help to heal his heart? 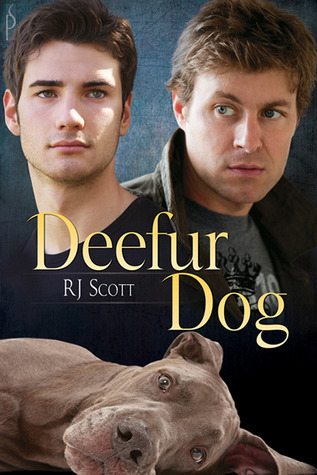 I have often lamented the fact that GLBT stories (the ones I’ve read, anyhow) tend to dwell on the serious side of life: bigotry, discrimination, complicated romances and such, so Deefur Dog by R.J. Scott [Silver Publishing, 2011] was a pleasant departure. I mean, who couldn’t like a story about a dog, a kid, a single father and light-hearted mayhem? The basic story revolves around a young single father, Cameron Jackson, his two year old daughter, and a Great Dane named Deefur. Deefur reminds me of the comic strip, canine character, “Marmaduke”—a well-meaning giant who is forever running afoul of human logic (which ain’t so hard to do in some cases). Jackson is a modern dad, inasmuch as he’s trying to run a household, be a father, and manage a growing business all at the same time. A live-in nanny seems to be the answer to the domestic side of it, but not to Deefur. For one thing the house is his den, and protecting the “pup” is his responsibility, so strangers must pass inspection before they enter his territory . Besides, some strangers simply don’t smell right. In this human-dominated world, however, canine logic is not always shared, and so it is Deefur who must make way. Enter Jason Everson, young, hardworking animal lover, who just happens to be looking for a job as a nanny and needs a place to live. Moreover, he even passes Deefur’s inspection. Voilà! Now, the only question remaining is whether the recently-bereft Cameron will find love again. This is a heartwarming story, and as I said above, “who couldn’t like a story about a dog, a kid, a single father?” It’s basically well written, too, and I love the cover, but there are some slight drawbacks between it and five bees. By his own admission R.J. Scott is a romantic, and I think this tends toward a “happy ever after” scenario before the wrap-up even comes along. For example, I thought the serendipitous meeting with Jason was a bit too opportune, and his acceptance by Deefur somewhat tidy. I hasten to add these are not serious flaws because the story is supposed to be light, but even toffee requires a little salt to enhance the flavour. That said, I liked it as a feel-good summer read that would go nicely with gin and tonic. Four bees. I purchased a copy of Micrsoft Office 2010 this week. As far as I can tell it’s not much different than 2007, but I thought they might have corrected the glitches in the latter—they haven’t. But the story is that I purchased three downloads, and it downloaded fine on the first computer. However, on the second it would go right to the very end (about 60 min.) and then abort. Ergo, I wasted six hours trying every combination and permutation without success. Thanks for dropping by. Summer is a great time for relaxing with a good book, so I hope you will choose one by the fine writers featured on this blog. Happy reading!